Within the autism community, we are all used to loss. It comes in many forms and affects us differently and in very personal ways. Some lose speech, some lose eye contact, perhaps we lose a grandparent or the ability to tolerate certain foods. Regardless of the loss, we feel sad and cheated as if life just keeps throwing curve ball after curve ball at us. We mourn, we deal, we move on until the next loss. These sad times bring us closer to our friends and family who lovingly carry us through and make the days tolerable. Today is such a day for me. A day of loss, and a very significant loss indeed. 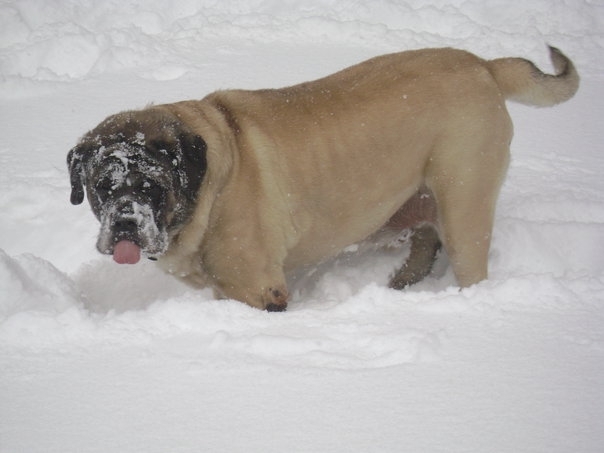 Today we lose our dog Dante who has brought happiness, love and devotion into our home for nine years. 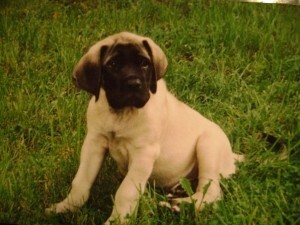 I remember the day I decided to get an English Mastiff. I had researched and read about multiple breeds to ensure that I chose the perfect pet for my growing family. I wanted to make sure that our next dog would be gentle, yet protective, and provide companionship and loyalty to all those who came into contact with him. I never imagined that this particular breed would meet all the rigid standards and requirements I had insisted on. Finding the perfect breeder was quite an ordeal. It is not a popular breed due to the sheer size of the animals. Many don’t have the space or means to care for such large dogs. But I loved everything I had learned about the distinguished Mastiff, and was convinced that I had made the right choice for my family. We waited on a six-month waiting list for our male pup. When the litter was born, there were four females and two males. Problem was that there were three people waiting for males and, of course, I was the third. We got bumped. Although I was disappointed that I’d have to wait longer, I knew that this meant I had pick of the litter on the next round. I got the call the following month and was told that this litter had two females and three males. The breeder chose a female to keep so I had pick of the three beautiful little boys. When the pups turned seven weeks old, my dad and I packed for the long six-hour trip to go pick up my dog. I was five-months pregnant with Nicholas at the time so this trip was a long one to say the least. 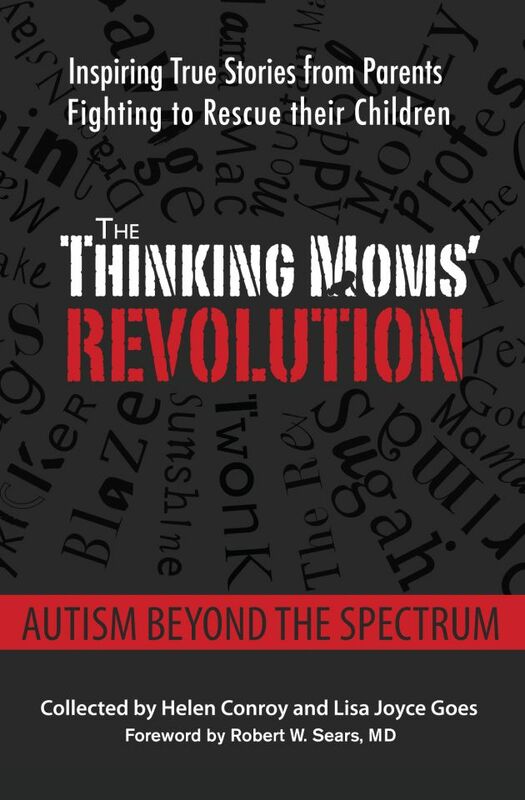 At this time, I didn’t know that my unborn child would someday be diagnosed with ASD. We arrived in Bumblef%*#, NY around midday and, as we pulled up, my dad asked why they had a black bear caged in a dog pen. 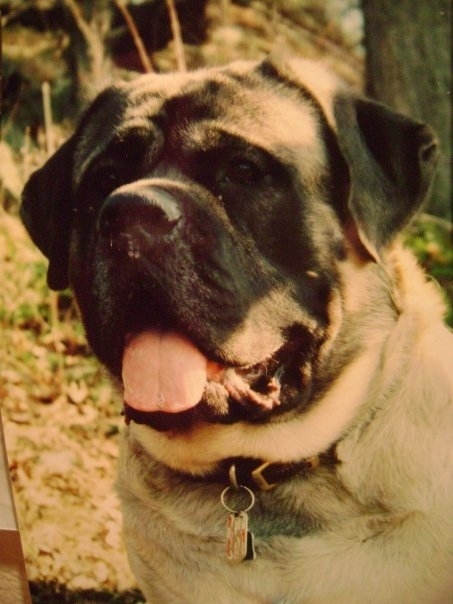 Uhhhhhhhh, yeah… It was actually a 265-lb brindle male Mastiff in that pen. He was HUGE!!!!!! I was a little taken aback, but made my way towards the house. We were led to the puppies who were playing in the grass. They were happy and healthy just as I expected. This breeder was truly amazing and she tested each of her dogs for genetic flaws before she allowed them to breed. I lowered myself to the ground and sat down Indian style, my big belly resting on my knees. I watched the puppies run around and come close, but then run away again to jump on one of their littermates. I watched their movements, looked at their eyes and went down my mental checklist to make sure I picked the perfect pup. As I sat there, one of the puppies kept circling me and eventually climbed into my lap and sat down. His eyes bright and friendly, he gently licked my face and hands. I wonder now, if he knew something I didn’t — if this little dog already had a connection with the life growing inside of me. My dad looked on in disbelief as I decided this would be my next dog, without even asking if it was one of the males. It was. We headed home with our new pet. We were told that he would probably cry, not eat and have a hard time sleeping for a few days since he would be away from his mother and littermates for the first time. When we arrived home, my son and daughter ran to greet us. We put Dante on the ground and he played with them as if they had known each other for a lifetime. When he came into the house, he ate and rolled onto his back, bare, pink belly showing and began to snore. He fit in perfectly. He never cried or needed any basic training. He just fit in. It’s so hard to explain, but I guess if I had to, I’d say Dante chose US, not the other way around. Dante grew rapidly. By the time I gave birth to Nicholas in January, he weighed over 100lbs at seven months. When Nick began to walk at one year, Dante was close to 200 lbs and officially hit his peak weight of 225 lbs soon after. His tail was like a baseball bat, capable of clearing any table with one swipe. I watched this massive animal maneuver his way through the kitchen like a bull, yet when Nicholas waddled in there, he immediately lowered himself to the floor and watched Nicky walk by. 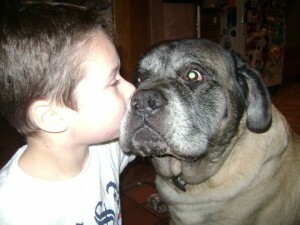 He would lick Nicky’s face if he was within reach, but was always cautious and gentle around the kids. He sat outside when they played and his eyes would scope his surroundings. He would always place himself between the children and any adult who was in the area. He guarded them in the least aggressive of ways. 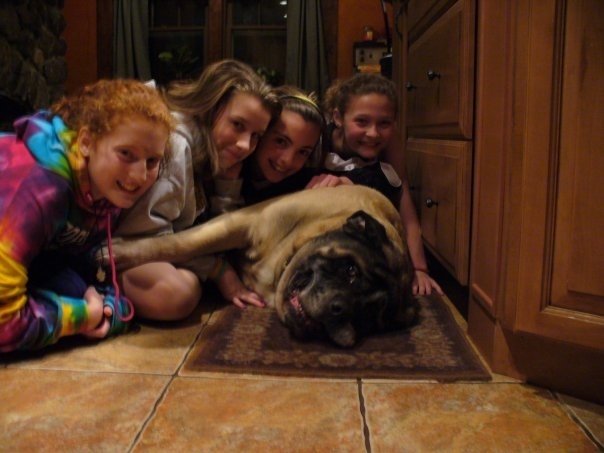 He truly was a gentle giant. When Nicholas was diagnosed, I sobbed. I sat on the couch and just sobbed. Dante rested his head on my lap and looked up with his big brown eyes. He was completely tuned in to my pain, and I cried with my face buried in his enormous neck. He sat there and allowed me to cry. Nick was trapped in his own little world. He had lost eye contact and he was not talking at all. He didn’t want to be hugged and we didn’t know how to reconnect with our son. As time passed, I noticed that Nicky would smile at Dante more and more. He eventually began to lie on the ground next to Dante and just kiss his nose. I would cringe as I watched him grab Dante’s ears REALLY HARD and pull so that he could kiss his dog on the nose. Dante loved every moment of it. He would immediately go into a playful and submissive position and lay on his back as Nick pulled, tugged and dove on top of him. Dante was reaching my son in a way I couldn’t. Nicky grew more and more affectionate with him, and they became best pals. Nicky never cared about any other dog. He didn’t care about the cute puppies people brought to the park, or the dogs that ran to greet him when we visited friends and family. 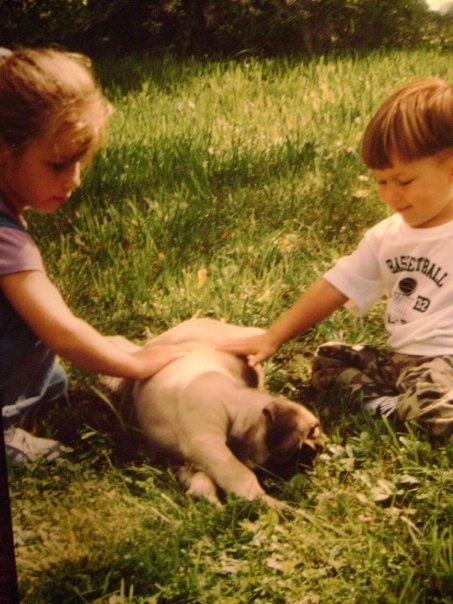 Before Nicholas was able to talk, we introduced him to my parent’s pug puppy Tico. We kept gushing over how cute this little dog was. Nicky simply walked over to Dante’s cookie jar, took out a dog biscuit, gave it to Dante, kissed him and walked out of the room. It was all about Dante and Nick was as loyal to him as he was to Nick. I then realized that this dog was indeed meant to be part of our family. On Monday Dante turns nine and I will have to lay him to rest. Our last veterinary visit revealed that he was riddled with cancerous tumors throughout his body. One of the tumors was pushing up against his trachea and he has stopped eating and drinking. He has tumors within his chest cavity, on his liver, in his abdomen and his lymph nodes. Our vet decided to give him an intravenous shot of steroids so that we could bring him home for the weekend to say our goodbyes. How do I do that? How do I say goodbye to a family member? How do I say goodbye to the dog that brought my son back to me? How do I let go of a family member that gave so much and never asked for anything in return? 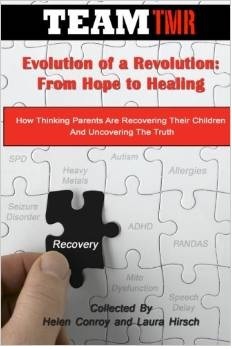 How do I prepare my kids? How do I prepare Nicky, who does not know a life without this dog? How do I say goodbye??? I sat on the floor with him and buried my face in his enormous neck once again. This time I cried because I was losing him. He looked up at me with the same look as when I cried for my son. HE was comforting ME. Even now he is still looking out for us. I wipe my tears and I whisper to my dear friend. “Thank you Dante. Thank you for being there when I needed you. Thank you for loving us. Thank you for bringing Nicky out of his world. Thank you for choosing me on that hot August day when you climbed into my lap.” Rest in peace my gentle bear. You will never be replaced in my heart. We love you big boy!!!! So sorry for your loss. I am crying. My ASD son, who has been fearful of all animals since before he could walk, has a very special bond with our little beagle (our Dante). May you and your family find comfort in all of your happy memories during the days and weeks ahead. All dogs go to Heaven, I pray you find comfort soon and that Nicky can find a love like this again. No other love compares to the true unconditional love of an animal. My son has a Pitbll, loyal, protective, gentle(despite the stigma attached to his name) and VERY in tune to LoRenzo’s world. He chose us too. What a beautiful being Dante was. I morned your loss this morning remembering my big boy…a year after my son´s diagnosis my big boy passed away. They are such a big part of our lives…especially when their bodies are as big as their hearts. Thanks for sharing with us your readers. The TMR always touch home on some level. My deepest regrets to you and your family at this difficult time. Our daughter has an autism service dog. I know the bond you speak of here and send love as you prepare for Dante’s transition. While Dante won’t be there in physical form, I doubt he’ll ever leave Nick’s side. And he’ll never leave your heart. What a good boy Dante is. What a very good dog. 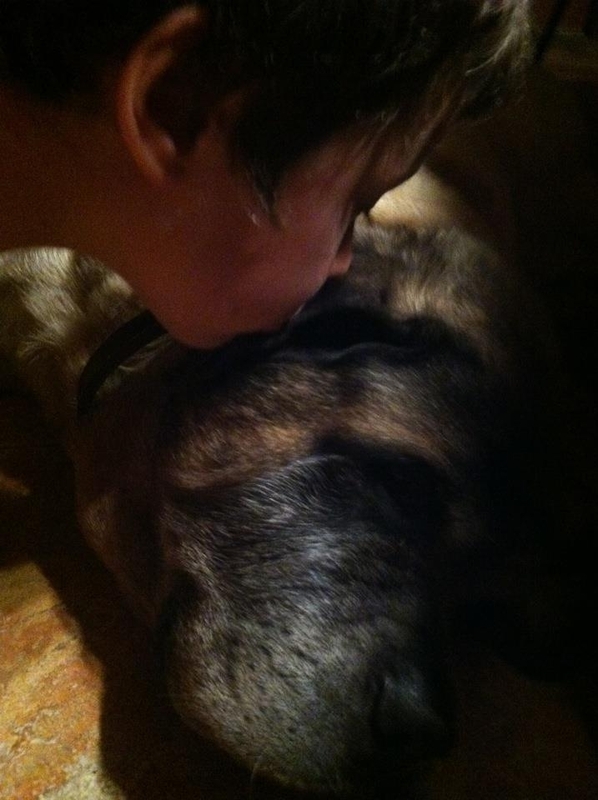 This one has made me cry … It is so hard to lose such a treasured family member. 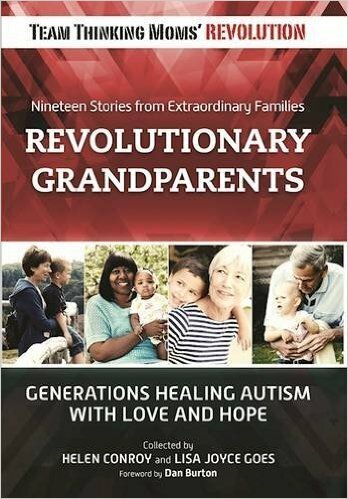 Thinking of you and praying for comfort for your entire family… I know how much our precious Banjo means to our family … to our ASD son … I can only imagine the loss your son feels at the passing of Dante … Hugs. Praying as you walk down this path together. Hugs to you, MamaBear. I haven’t lost a pet since 4th grade, and I think it was so upsetting I’ve avoided that situation ever since. It hurts. Love you. I am so sorry for your loss. here I am crying and finding comfort in the hope that we will see our dear pets in heaven one day. I am sure Dante is in heaven now, running through the fields of flowers and grass, playing with other animals and free from pain, suffering and discomfort. God bless you and your family. I read the TMR blogs religiously. This is the first one that brought me to tears. I so feel the loss you are experiencing right now. Pets are such a huge part of our family and when we lost our 14 year old cat last year I cried for a week. Dante was even more important to your family and I can’t imagine how Nick will do without his best friend. Hugs to you and your family! Im so sorry for your loss! We have 2 Mastiffs and they are such gentle giants and lovers. It’s always hard losing these guys. Sending peace and positive vibes your way! Crying as I mourn for your loss and still mourn for the loss 2 years ago of our boxer who had the same sort of tumors. Our pets are truly members of our family and deserve our love and care while they are with us and our tears when they are gone. I hope his presence in your heart continues to comfort you as he did when he was with you in body. when we were in similar situation with our much loved dog, we had plaster casts made of each of his paws. The vet did this for us. It was a service offerred at the Vets. In the years since, we have been glad to have the casts… a nice sort of keepsake of his actual paw prints. will tell you something rather nifty (I thought) a grown child did with the casts, or impression there of.. He said “Pup always had my back, and was always with me when alive, and is nice to think he does now”, so he had the exact paw print impression tatooed on his top back shoulder…. I’m not advocating tatoos, but if one is going to have one…I did think it was a nice sentiment..
HOLY MOLY! 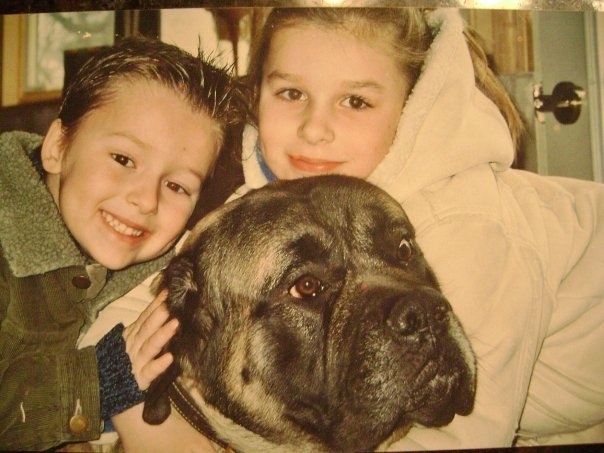 I have a Mastiff mix..an amazing animal and a huge part of our family. He is a gentle giant and so in tune to the feelings of those around him. A story like yours is why dogs are so special. I am so sorry for your loss. I am SOOO SORRY for your loss. I felt so touch by your story that I actually cry readding it. GOD BLESS YOU and you son. Be strong for your family. Like the others who have commented before me, I too am in tears and so sorry for this great loss of yours. If I had 3 wishes – well you probably all know what the 1st wish would be 🙂 – but I think the next wish would be for dogs to live longer lives here on earth with us. Their earthly lives are just way too short. We lost our wonderful dog Sully in April 2011 due to cancer and he, too, was 9 years old. Honestly, I am still mourning that loss over a year later. He was everything . . . and more. It’s times like these that I wish I had the innocent, unknowing mind that our 16 year old son with autism has – he tells us and is under the belief that “daddy took Sully to the pet store” and that Sully is alive and well and happily living at the pet store (although we got Sully from a private breeder and not a pet store:) One day as we were pulling out of our driveway, there was a girl walking a Wheaten Terrier, the breed of our Sully, and my son yelled to me “STOP the car, it’s Sully!” If only . . . I am sitting here crying and struggling to find words. Take comfort in the fact that Dante will continue to watch over all of you. When you have a connection like that, it doesnt go away. Love you guys xoxoxo. What a great story about the biggest of all dogs. You didn’t realize he was a therapy dogv when you got him. You don’t forget the dog that went through autism with your kid. OMG, I am so sorry for your loss:( I am in tears right now for I know firsthand how an animal can truly touch the depths of your soul. Our dog is also 9 so as she ages, I fear the day that her time on this Earth will come to an end. May you and your family gather strength from one another to get through this difficult time. HUGS!!!!!!! !